Moving to a new city means discovering your new favourite restaurants as well as hidden eatery gems. We thought we’d lend a helping hand by giving a shout-out to some great restaurants located in both the Queen’s and St. Lawrence areas! • The Rustic Spud – 175 Bagot Street – the perfect place to bring a date. Customers rave about the excellent food and atmosphere. • Wooden Heads – 192 Ontario Street – a Kingston favourite for delicious pizza. While this restaurant can be a bit pricey, the food is worth it. Be sure to make reservations far in advance! • Sima Sushi – 66 Princess Street – a sushi-lover’s dream. The ingredients are high-quality and delicious in this contemporary Japanese eatery. • Red House – 369 King Street East – a trendy spot with great pub fare. Reasonably priced food paired with local craft beers. • Peter’s Place – 34 Princess Street – the best breakfast food in town. Very affordable prices, tasty food, and friendly service! • Portsmouth Tavern – 96 Yonge Street – a quaint pub in a beautiful location. Check out the live music or give karaoke a try! • Kais Delight – 680 King Street West – the best Chinese food in town! Customers love the big portions and great prices. • Portsmouth Village Pizza & Take-out – 105 Mowat Avenue – great menu selection and delicious pizza. The perfect place to go to after late study nights! • Days on Front – 730 Front Road – a casual fine dining restaurant featuring local ingredients. 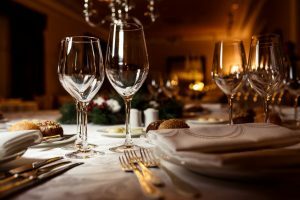 This restaurant is perfect for a special night out. • Sakura Japanese Restaurant – 1350 Bath Road – all you can eat sushi, need we say more? No matter what you’re craving, Kingston has so much to offer in the culinary scene! Let us know if you like our selection or what your favourite restaurant is! Follow us on Facebook and check out our available units at http://www.panadew.ca/property_type/student-rentals to find your new place near the restaurants you love.